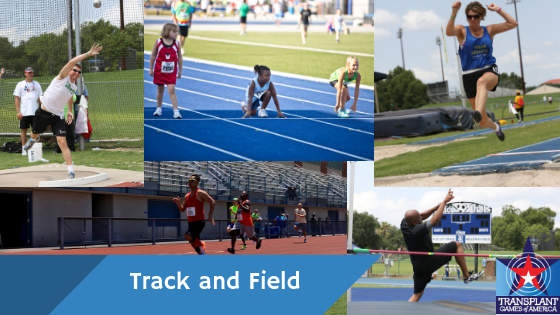 The track & field competition will have the following events for men, women and youth. *Note: Relay teams can be mixed age groups (14 and older), but athletes must all be from the same division and same team. 2. The age category of competition for relays will be determined by the younger age of the athletes on the day of Opening Ceremony – July 18, 2020. Competitors will compete in their own gender, age category and division. All events will be timed finals. When there are multiple heats in an event, the ranking of the competitors for medals or advancement will be based solely on time. Medals will be awarded to first, second, and third in each event to Division 1 and Division 2 athletes by gender and age groups. 1. Event check-in will be 30 minutes before each event under the check-in tent. 2. Competitors will get bib numbers at competitor check-in. 3. Track & Field staff will be responsible for queuing competitors prior to the scheduled heat and will direct athletes to the start line. 4. Track & Field staff may combine events/divisions based on schedule and number of competitors. This will not affect medal award categories. 6. Individual teams will decide who will participate in relay events. At their discretion teams may mix age groups but age group category will be determined by the youngest athlete on a relay team. Children under 14 cannot mix with adults. 7. All equipment will be provided for track and field events; no other equipment will be acceptable for competition. 8. For the mixed relay, there can be no greater than 2 males per team. 4. Shot put, discus, long jump, and softball throw participants receive 3 throws – no finals. 5. High jump participants receive 3 jumping opportunities at each height to successfully clear the bar. 6. Softballs are 11” women’s collegiate fast pitch regulation. USA Track & Field Rules will apply. With some modifications. Once an event is completed and results are available, track and field staff must record all competitors and times/scores to the appropriate system/documents. When electronic scoring is being utilized a manual backup system must be in place to record results.